Die Feier zum 10-jährigen Jubiläum der a.r.t.e.s. Graduate School und das a.r.t.e.s. forum 2018 finden in Verbindung miteinander an zwei aufeinanderfolgenden Tagen statt. Die a.r.t.es. Graduate School lädt herzlich zum 10-jährigen Jubiläum ein. Im Rahmen der Festlichkeiten werden wir mit a.r.t.e.s.-Alumni sowie Vertreterinnen und Vertretern der Universität die Vergangenheit, Gegenwart und Zukunft der Graduiertenschule beleuchten und den Abend im Anschluss bei einem Empfang ausklingen lassen. 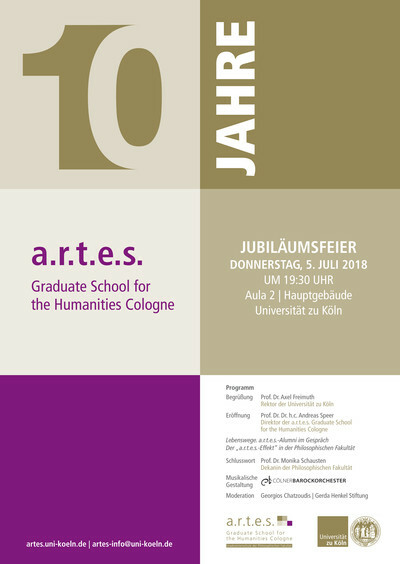 Um Anmeldung per E-Mail an jubilaeum-artes(at)uni-koeln.de wird gebeten. Social practices have established themselves in the human and social sciences as a fundamental category of research. Yet it remains unclear as to how social practices and the current debates about them relate to a wider societal horizon. After several practical turns it seems that the term “society” no longer plays a leading role in or has been explicitly dismissed by many fields in humanities research. The main concern for researchers is to identify social practices in the past and present, which different actors execute contextually or situationally. Only the connection and efficacy of social practices explain the production of social relations, effects, and facts. The latter are scrutinized in their local and cultural-specific genesis or in their ethnographically, linguistically, or aesthetically documented effectiveness. Nevertheless, which understanding of societal or collective collaboration does the term “social practices” imply or invoke? A political or critical claim – sometimes academic, sometimes socio-political in nature – seems to come along with certain kinds of practice-theoretical approaches. The praxeological procedure is thus closely connected to the disassociation and problematization of sociocultural relations as well as to normative questions that are, however, not always made explicit. Expressions like “taking responsibility for society” or inquiries into the “social relevance of research” indicate that responsibility itself can be understood as a practice of normative appeal and imputation, in which people are being made responsible to take or initiate action and advancement. “Society” still acts as a benchmark, which permeates the appeals to action, behavioral norms and social forms of practice – including scientific and academic. The a.r.t.e.s. forum on Societies and Social Practices would like to canvas the titular key words from two directions. On the one side, it wants to take up the question and push further on whether the political/critical/normative implications of practice theories should be more explicit and reflected upon. To what extent have praxeological perspectives brought forth diagnoses of their times and/or modified diagnoses and depictions of society? Which conceptions of society, social practice models or ethically reflected projections of the future arise as a result? To what extent is research oriented towards social practices already a normative practice itself? Moreover, to what extent does practice-theoretically informed research also ask ethical questions about the good life? On the other side, there is the question as to what replaces the fundamental concept “society” which has quasi-unified theoretical-methodical as well as political and ethical aspects in the sense of social critique and activism. Which terminological alternatives for “society” are presently available and which concepts do researchers currently work with? Which normative implications and what analytical value would a critical reintroduction of the term have? Are processual terms like “Vergesellschaftung” (Weber/Simmel), and related concepts like “constitution”, “formation”, “interrelations”, “assemblage” or even interconnected “practices” preferable? The a.r.t.e.s. forum 2018 aims to steer the debates on social practices towards a redefinition of the term “society” in the humanities. 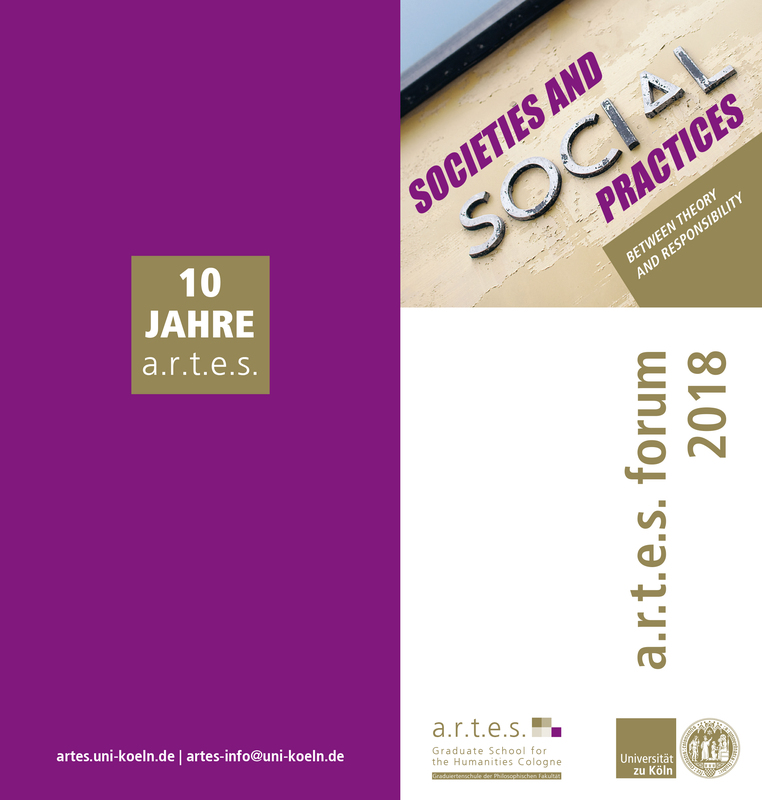 At the center of the forum lies the two-fold question: To what extent do the reconstruction and investigation of social practice contexts require a conception or category of “society”? Does such an approach involve a personal as well as social responsibility and political commitment on the part of the researchers? In the first part of the conference, four researchers will address these issues. A commentator from another discipline will then respond to their answers. 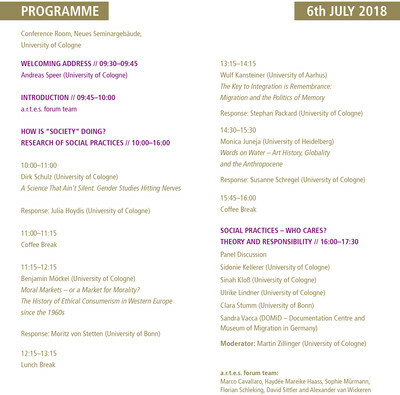 In the second part of the program, the interdisciplinary dialogue will proceed in the form of a panel discussion, which reflects on the responsibility of research practices and their effects on societies. The participants are asked whether practices of research in the humanities are still possible without addressing the problem of their social responsibility. In light of the increasing pressure to legitimate the humanities and the difficulties in acquiring funds, such questions transcend the narrow academic and interdisciplinary relevance of the forum’s topic and raise the issue of personal and collective involvement.